Boo! After only seven weeks, Ant and Dec’s Saturday Night Takeaway comes to an end tonight. The series has been the best yet, with guest appearances from Robbie Williams, One Direction and even PJ and Duncan!! To mark the end of another series, we look at the best moments from the past few weeks..
1. Let’s Get Ready to Top the Charts! The public took the track to their hearts all over again, and in a bizarre twist of fate it ended up at the top of the charts, giving Ant and Dec their first ever number one single. Ant and Dec weren’t short of big name guest stars for the show, but Robbie Williams had to be among the best. The Take That legend sang and danced his way through a very wet rendition of Singing in the Rain, before being joined by the boys in raincoats and umbrellas for the big finale. Rob looked like he was having the time of his life – as were we! The show’s undercover segment provided most of the big laughs, and everyone from Louis Walsh to Piers Morgan was pranked by the cheeky Geordie duo. However, it was setting up teen heart throbs One Direction which proved the funniest. Dressed as a manic fan, Dec scared the boys half to death, although it was Ant’s fake New Zealand TV presenter that stole the show. 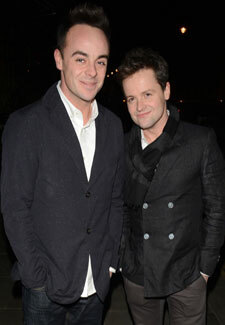 Little Ant and Little Dec appear to be getting younger – and even funnier. The tiny tots gatecrashed Britain’s Got Talent to interrogate Simon Cowell, David Walliams, Alesha Dixon and Amanda Holden, with hilarious results. And let’s face it, anyone who can put a smile on Simon’s face is alright by us! The Canadian crooner didn’t take too kindly to Ant and Dec legging it down the pub before his closing song. In (mock) fury, Michael and his band followed them to the bar, singing the whole way. When he finally made it, he told the boys off, swigged a pint of beer and did a karaoke rendition of Let’s Get Ready To Rhumble.